UNESCO World Heritage Sites since 1998, as part of the Knights' Fortifications around the Harbours of Malta. 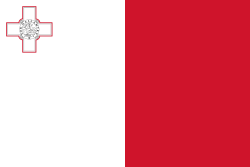 Malta is to be flown together with the flag of the Order in a prominent position over Saint Angelo. No asylum may be granted by the Order and generally the Maltese courts have full jurisdiction and Maltese law shall apply. A number of immunities and privileges are mentioned in the second bilateral treaty. Other parts of the fort are leased to the Cottonera Waterfront Group, a private consortium. Fort St. Angelo, with the four batteries constructed by Grunenburgh visible to the left. D'Homedes Bastion – built during the reign of Juan de Homedes y Coscon. It was heavily altered since the 16th century, especially when it was converted into a gunpowder magazine. Part of the bastion was destroyed in World War II, but the damage was repaired in the 1990s. Ferramolino's Cavalier – a high cavalier near D'Homedes Bastion, built between 1542 and 1547. Its roof had eight embrasures, and several magazines and a beacon were also located on the cavalier. De Guiral Battery – a small sea-level battery on the western side of the fort. It was named after Francesco de Guiral, its commander during the Great Siege. The battery was altered in the 17th and 18th centuries, and again by the British. Castle – True Ghost Story". The Horror Movies Blog. Retrieved 27 June 2015.